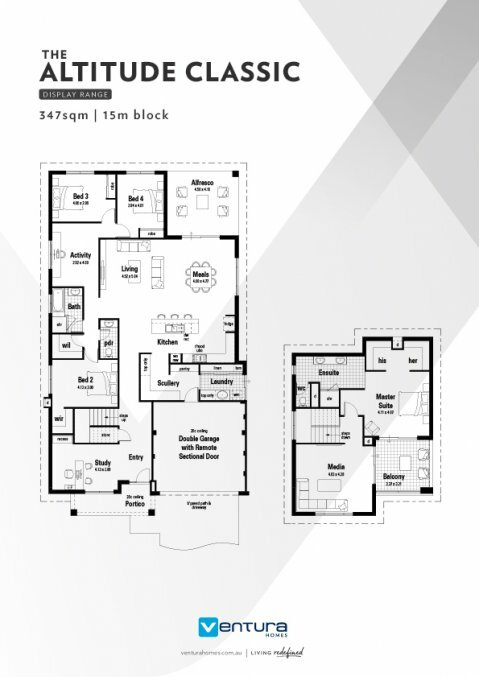 Take a step inside The Altitude, a stunning two storey display home designed for modern family living. Upstairs features a spacious balcony with access to both the master suite and media room. The master bedroom is the perfect parents retreat boasting a his and hers walk-in robe and a stunning ensuite with free-standing bath, twin showers and double basin. On the ground floor is the expansive open plan living featuring a kitchen with scullery and a stunning breakfast bar with waterfall ends. The three secondary bedrooms are grouped in the left wing, sharing a bathroom, powder room and activity room.